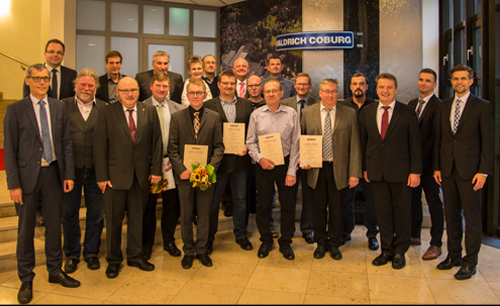 The machine tool manufacturer WALDRICH COBURG has honored 10 employees with 40 years of service and 7 employees with 25 years of service with a jubilee ceremony. The jubilees are from the assembly, production and design department. Many of them started their career with an apprenticeship at WALDRICH COBURG and even many of their parents or grandparents had worked there for many years. CEO, Hubert Becker, congratulated the jubilees for their many years of work and gave a short review of the company history. He explained that WALDRICH COBURG has always been confronted with business fluctuations in its long history. This is also valid in the present situation, but Mr. Becker sees a positive development for the second half of the year. The managers of the different departments gave a short laudation for each employee and said thanks for the work and loyalty to the company. For 40 years of service were honored: Dieter Heubisch, Winfried Becker, Bernd Ellmer, Eberhard Ganß, Martin Herr, Franz Hones, Birgit Mahler, Michael Schulz, Klaus Tiefenthäler, Dietmar Kuschal. For 25 years of service were honored: Thomas Härtel, Stephan Korschofsky, Stephan Kupfer, Mark Martin, Thomas Otto, Nils Reichenbacher und Stephan Schlabschy. We wish our jubilees all the best for their future.